This is my latest finish, a project I thought might never resurface from underneath my sons bed -which is where it sat for a few years until this past year's BMQG retreat held in March. I blogged about it a few times: here, here, and here. But it's finally finished and I am pretty happy with it! I was able to use the Statler Stitcher at Laurena's recently and finally quilted it. I let it sit for a while after the retreat because I didn't know how I wanted to quilt it. I knew that I wouldn't be okay with a free motion rush-job after all of the headaches this quilt has caused me. I chose a bubbly-loopy pattern that was done in a few hours. I thought using the computer-controlled longarm was more fun than I expected and I felt very satisfied with the results. My family and I visited Fort Foster park in Kittery, ME to take these pictures. It was Charlotte's first time at the ocean and we had a lot of fun. The quilt already has a sleeve on it so that it can hang at this coming weekend's BMQG Appleton Mills Lowell Quilt Festival exhibit. I thought it would be fitting to enter it into our LQF exhibit because my guild members were encouraging (and sometimes shaking their heads in disbelief) when I was ironing and pinning constantly during the March retreat to finally get this beast completed. I never would've paired the colors plum, orange, fuschia, gold, aqua, and brown together to make a quilt as my own original combination/idea but I think it works well and it's very pretty. This quilt measures 80 x 84. I used about 7.5 yards of a Michael Miller aqua geometric print bought ages ago at Marden's for the borders, backing, and binding. I added prints from my stash to complement the Mendocino fabric collection that dominates the clamshells. 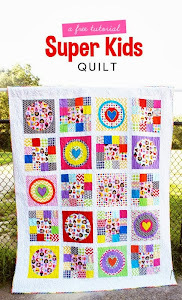 The pattern is based on the "Picnic Quilt" from Sandy Henderson's Sewing with Bits and Pieces. I used a Hobbs 100% cotton batting purchased on sale at Connecting Threads. I was not impressed with the quality of the batting at all - it had a lot of pill to it and seemed to be pretty fragile (i.e. tear apart if I pulled on it slightly). The quilt seems fine now, but I was nervous working with that poor batting while I was having the whole thing quilted. It feels so good to finally have finished something since I have so many WIPs and lots of tops that need quilting. Thanks for reading! Wow! This quilt is just stunning. The computerized quilting does look great! You choose a perfect border fabric the clamshells seem floating in the water. GASP! I LOVE IT!!!! I'm so excited to see this done. It looks awesome. its beautiful laurie...i just love it. It is so pretty! I can't wait to see it in person. I love that the clamshells are in the direction opposite from what we normally see. Love the wide border at the bottom, too. Congrats!! Oh my, I love this so much, and the photos are stunning! 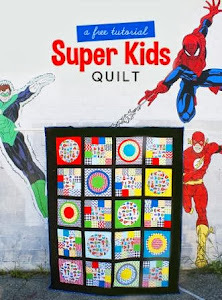 I love all the quilts you make, so so much. Great setting for this beautiful quilt! UI love the fabric, the quilt AND the photo of it!